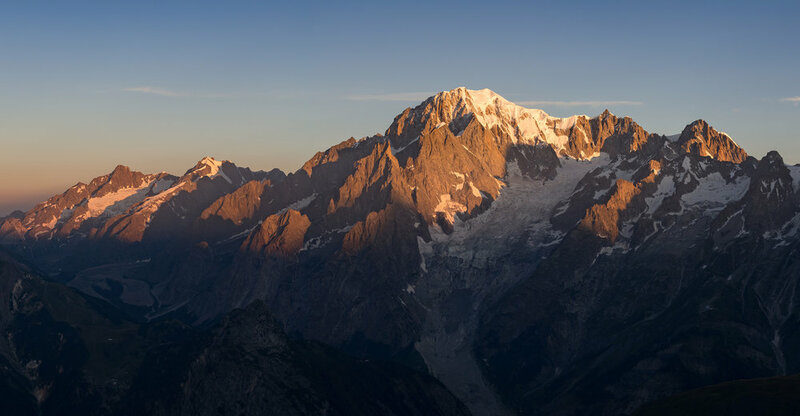 A panoramic shot of Mont Blanc shot from Tête de Licony (August 2018). Credit Ben Tibbetts. We all want to get great photographs. Whether that’s for our own memories or to share them with the world. For Ben Tibbetts, however, getting great photographs isn’t just about pointing the camera. It’s about finding the perfect spot to capture the Alps in its finest light. For over six years, Ben has been working on Alpenglow - a book that offers stories, photographs and unique pencil drawings of the finest climbs on all 82 4000m+ peaks of the Alps. With over 700 days of climbing, shooting and sketching behind him, the book is complete. We catch up with Ben to discover how he explores the mountains and plans his locations to get the photos that make his book so unique. Check out the interview with Ben below or head straight the the Kickstarter page to bag yourself those early specials that include signed copies and limited edition sketches! FATMAP: What are you thinking about when you’re planning to capture these photos? Ben Tibbetts: For me, to get an excellent mountain image I find I need to be in a carefully planned location that offers an uninterrupted view of the mountain at sunset or sunrise. The question I then have to ask is where is that perfect location… and can I even get there? I use FATMAP at the planning stage of a trip at home on the computer - moving around the mountains to see what views I can get from which ridge, spur or summit. I then use the gradient functions to assess, especially in winter, how easy and/or risky the access might be. A steep slope above 30º means I need exceptionally stable snow conditions to venture up there. FATMAP: And what are you looking for? Ben Tibbetts: The problem is that in a complex mountain environment it is really hard to work out whether a smaller peak in front is going to block out a crucial bit of the view. Only by first-hand knowledge, or a previous photo taken from the location (both of which are often hard to come by) can I know whether a location is going to serve up the goods. As most of my images are from fairly obscure locations on these missions FATMAP has been invaluable, allowing me to virtually fly to a location, see the mountain view I want to get and also get a sense for the access. Ben Tibbetts: From a conventional map it seemed that the summit of the Tête des Fra would provide an excellent view of the east face of Mont Blanc. Only by using FATMAP did I realise that this would have been OK, but the mountains in front were going to block more of the view than I expected. Nevertheless we went there and took a nice image of Mont Blanc from Tête des Fra whist ski touring but all the mountains in front of Mont Blanc are a bit distracting I thought. Mont Blanc from Tête des Fra, Italy. Credit Ben Tibbetts. Ben’s position on the Téte des Fra. Click through to see his Waypoint! Ben Tibbetts: By hunting through terrain and locations on FATMAP I found the perfect position for a similar but unobstructed view. Whilst it was still winter I couldn't access any of the better locations as the terrain there was too steep and prone to avalanche in winter. However the Testa di Liconi turned out to be the perfect location in Summer and Autumn, though it made for a long 5 hour hike to get there! Ben’s position on the Testa di Liconi. Click through to see his Waypoint! Ben Tibbetts: And then once again, but requiring much more mountaineering to get there from the North Ridge of Gran Paradiso on Becca di Montandayné. Mont Blanc at sunrise from Becca di Montandayné, Italy. Credit Ben Tibbetts. Ben’s position on the Becca di Montandayné. Click through to see his Waypoint! Ben Tibbetts: I prefer the light to be falling diagonally across the mountain (i.e to be at a vantage point where I can see both the sunlit ridges and faces and the shadows they cast.) Once I know at what angle the sun will set I can look at a map and work out where I need to be.. more or less. Sometimes I come back to a spot at a different time of year to get the best lighting. Below is Mont Blanc from the same place as the headline image, but in October 2017 rather than the better image from August 2018. In October the sun rose right behind me making the mountain look quite flat. In August it rose at about 30º to my north and highlighted the mountain structure. A panoramic shot of Mont Blanc shot from Tête de Licony (October 2017). Credit Ben Tibbetts. Ben Tibbetts: Before I leave for a trip I then download the data onto my phone for use offline (often poor or no reception in the mountains). Recent phones have excellent GPS chipsets and I use FATMAP to help navigate. I am often moving about in the dark to get to the right places for dawn or dusk and the app makes understanding the terrain around me much simpler than a 2D map. I also use the gradient and avalanche layers to inform myself about the terrain ahead or above me so I avoid straying into or under steeper or more serious terrain than I want to! FATMAP: How do you think people can use this to go find their own epic spots? Ben Tibbetts: For me, FATMAP helps me work out if I can get the shot and, if not, where I need to go. I think anyone can use it to explore the mountains to find cool summits to take great photos or just find great viewpoints. Like I said, both being able to virtually fly to a location then plan a route, drop waypoints and analyse the terrain are all super useful tools! FATMAP: Thanks, Ben. And where can people get the book? Ben Tibbetts: We’re on Kickstarter now so that’s a great place to pick up the book and get some extras. You’ll always be able to get the book from my website and I post all my photos on Facebook, Instagram and Twitter. Ben has shared his plans so you can take a look at all the different areas he explored when getting all those amazing photos. You can even save them to your own profile and share them with your friends! Ben Tibbetts is an adventure photographer, artist and an internationally certified (IFMGA) mountain guide. Alpenglow is the result of his many years working and exploring the mountains. Including TOPO descriptions and optimal climbing conditions for all 82 4000m+ Alpine summits, the book is a large format book of photographs, stories and drawings. The book is launching on Kickstarter October 29th, 2018 and available via Ben’s website.